Who are these Silver Creek people anyway? Well jump into the wayback machine and flip the dial to 1994, destination: the misty mountains of Southern Oregon, and awaaaay we go! 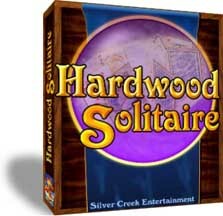 Yep, we've been making games since 1994 when we started work on our 1st card game, Hardwood Solitaire. We figured that we could make a better solitaire game than what was out there in a weekend. Well we were wrong, it took quite a few weekends actually and a fair share of sleepless nights, but in the end the results we're like nothing that anyone had ever seen in a card game before. Back then when most games were shown with just a few colors, we finished the first card game ever that had 16 million colors in it's palette. Creating games that look as good as they play has been our goal since day one. It's taken us a long time to build up from there and continue to polish our game making craft, but now we have a whole line of great products that thousands of people play every day and from all over the world! It's been a lot of hard work, but in our opinion making you a top notch game is worth every bit of effort. So who is Silver Creek? We are hard working folks just like you that understand the value of a dollar. So if you buy one of our games, you're going to like it or you'll get every penny back with our 30 day money back guarantee. The guarantee might be a bit dusty and unused, but it's ready to go into action if you need it.